The Global Volcanism Program has no activity reports for Hoodoo Mountain. The Global Volcanism Program has no Weekly Reports available for Hoodoo Mountain. The Global Volcanism Program has no Bulletin Reports available for Hoodoo Mountain. Hoodoo Mountain is a flat-topped Pleistocene-to-Holocene volcano in the Boundary Ranges of NW British Columbia near the Alaska border that is composed of both subglacial and subaerial volcanic products. Valley glaciers surround the volcano on all except the south side. The Pleistocene Little Bear Mountain basaltic tuya adjoins Hoodoo Mountain on the immediate north. Most of the volcano formed beneath glacial ice; all flank flows appear to have originated from beneath the current 4-km-wide summit icecap. More than 90% of the volcano, which dates back to at least 100,000 years, consists of interlayered peralkaline phonolitic and trachytic lava flows and hyaloclastites. At least one subaerial explosive eruption produced a welded and unwelded ignimbrite sequence on the north side. The most recent stage of volcanic activity produced subaerial unglaciated lava flows with well-preserved lava channels that originated from summit and flank vents about 9000 years ago. Edwards B R, Edwards G, Russell J K, 1995. Revised stratigraphy for the Hoodoo Mountain volcanic centre, northwestern British Columbia. Geol Surv Can, Current Res. 1995-A: 105-115. Edwards B R, Russell J K, 1994. Preliminary stratigraphy of Hoodoo Mountain volcanic centre, northwestern British Columbia. Geol Surv Can Pap, 94-1A: 69-76. Edwards B R, Russell J K, Anderson R G, 2002. Subglacial, phonolitic volcanism at Hoodoo Mountain volcano, northern Canadian Cordillera. Bull Volcanol, 64: 254-272. Kerr F A, 1948. Lower Stikine and western Iskut River areas, British Columbia. Geol Surv Can Mem, 246: 1-94. There is no Deformation History data available for Hoodoo Mountain. There is no Emissions History data available for Hoodoo Mountain. 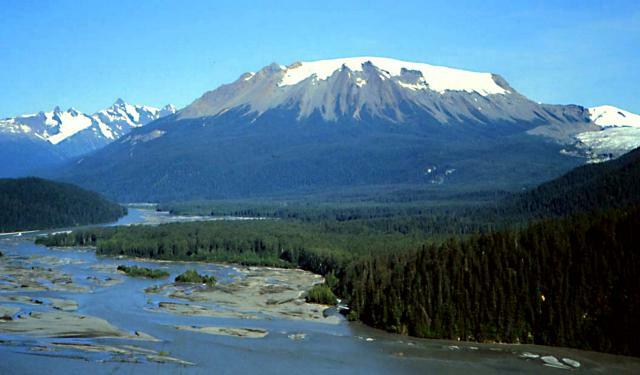 Hoodoo Mountain, as seen from the SE across the Iskut River in northwestern British Columbia, is a flat-topped stratovolcano. It has an ice cap 3 km in diameter and has had several periods of subglacial eruptions. Most of the volcanic deposits at Hoodoo Mountain are lava flows. The oldest eruptions of the volcano occurred about 100,000 years ago and the most recent eruptions about 9000 years ago. Hoodoo Mountain volcanic complex is one of the largest peralkaline volcanoes in the northern Cordilleran volcanic province. Photo by Ben Edwards, 1994 (Dickinson College, Pennsylvania). There are no samples for Hoodoo Mountain in the Smithsonian's NMNH Department of Mineral Sciences Rock and Ore collection. Large Eruptions of Hoodoo Mountain Information about large Quaternary eruptions (VEI >= 4) is cataloged in the Large Magnitude Explosive Volcanic Eruptions (LaMEVE) database of the Volcano Global Risk Identification and Analysis Project (VOGRIPA).